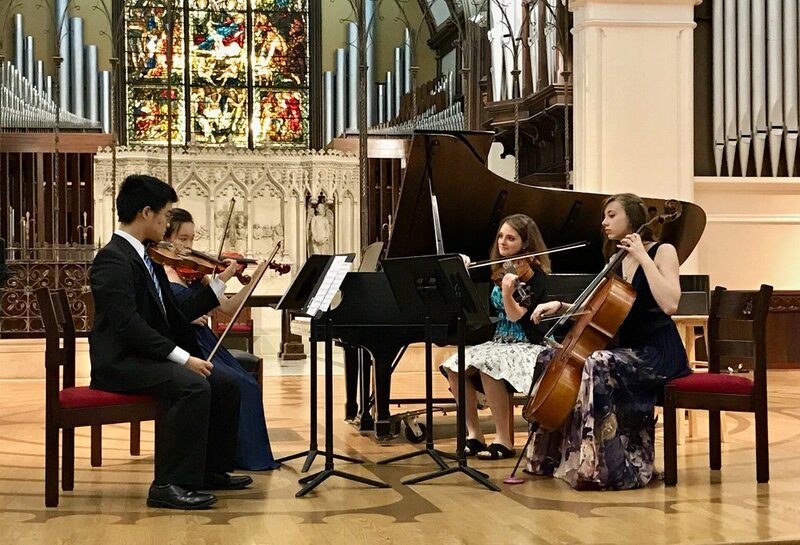 The Chamber Ensemble Program is for talented musicians who participate in one of AYPO's advanced orchestras: the American Youth Symphonic Orchestra (AYSO) or the American Youth Philharmonic (AYP). Ensembles are formed based on the applicant's video audition, orchestra, and instrument, at the discretion of the artistic and administrative staff. The ensemble instrumentations vary depending on repertoire that includes a mix of strings, woodwinds, brass, harp, and piano. The program gives musicians the opportunity to enhance their musical development by studying and performing chamber music under the guidance of professional instructors. The acclaimed Ensemble da Camera of Washington (EDCW) is AYPO's ensemble-in-residence and consists of clarinetist Claire Eichhorn, pianist Anna Balakerskaia, and violinist/violist Ricardo Cyncynates. The EDCW coaches each group of student musicians and leads public master classes throughout the season. AYPO's Chamber Ensemble Program is supported in part by a generous grant from the National Endowment for the Arts.